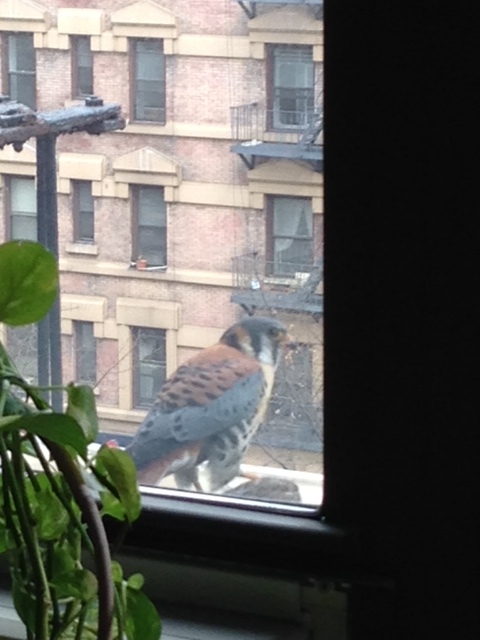 My neighbor Janet had an astonishingly beautiful, if rather ferocious visitor for lunch yesterday. She was working in her kitchen at midday, when she heard a strange repetitive banging sound coming from the living room. She moved to the doorway, and saw a bird on her air conditioner. This is nothing unusual in itself. Pigeons and mourning doves often perch there. 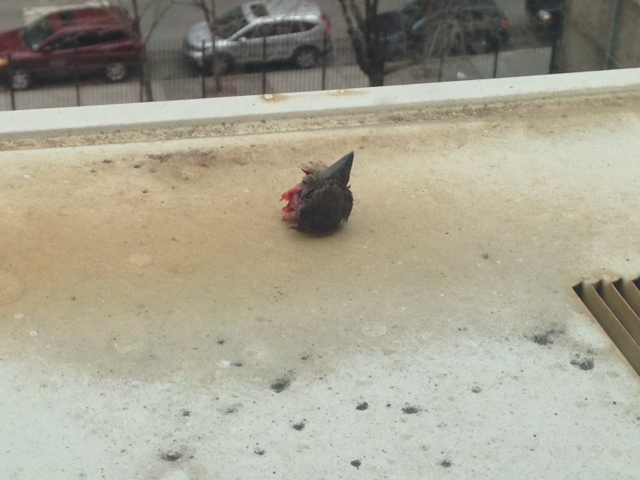 But this little bird was no dove. 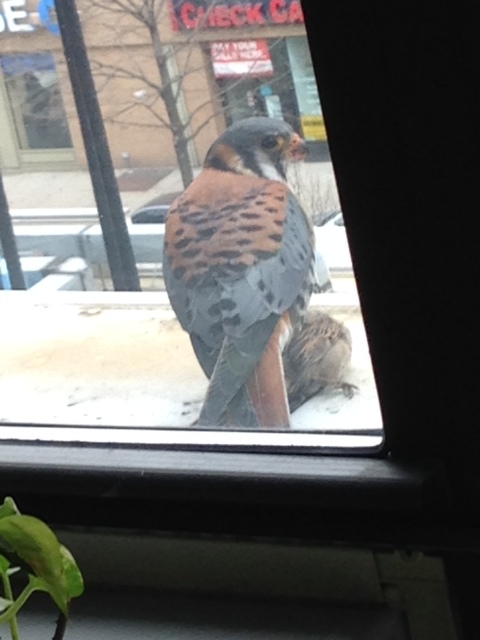 It was a tiny male hawk, or rather a falcon, no bigger than a blue jay, called the American Kestrel. Kestrels are the smallest raptor in North America with a range from Mexico to Canada. Their populations are in decline in many parts of the continent due to habitat loss and pesticides that kill off the insects they feed upon. 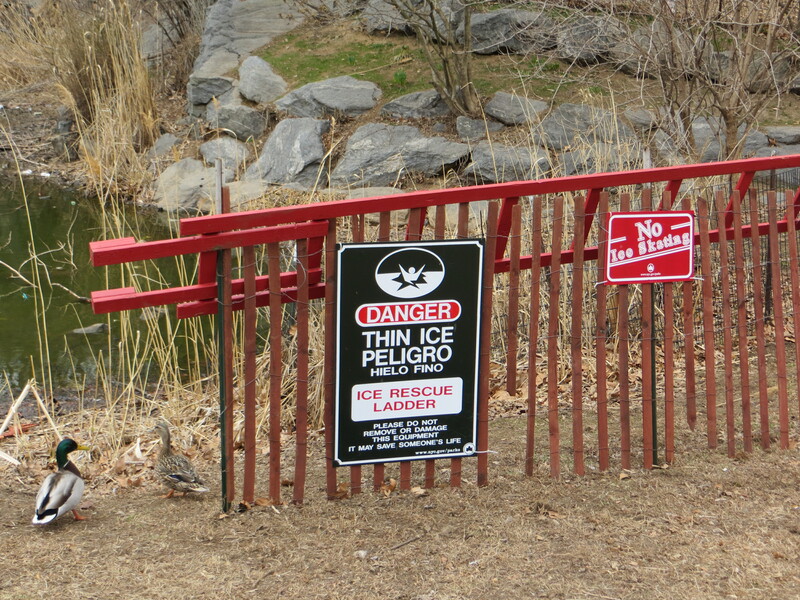 Yet the little raptors seem to be thriving in New York City. 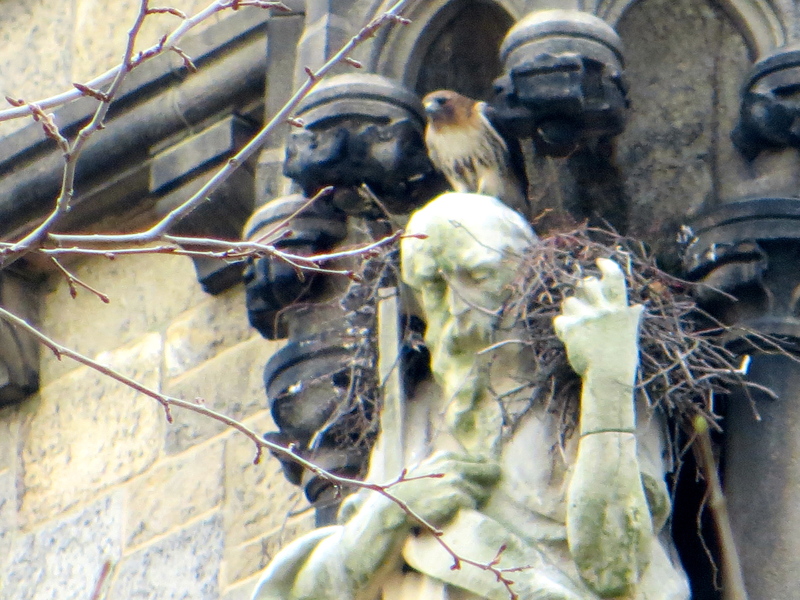 Like other hawks and falcons that have adapted to urban life, they find that man-made structures serve their needs quite well. 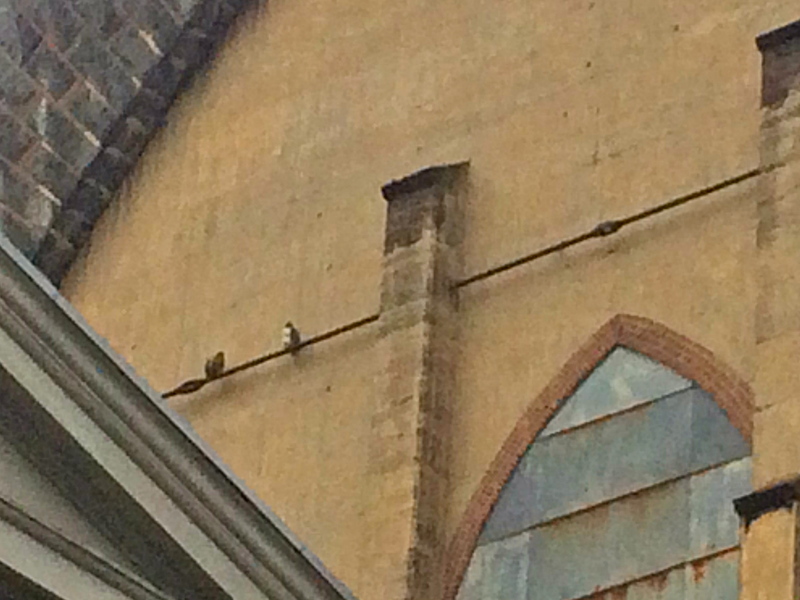 While their big cousins, the peregrine falcons, nest high on skyscrapers and bridges, the little kestrel prefers to raise its young in the broken cornices of old brownstones and mid-rise apartment buildings. Their prey includes insects, small mammals and birds, like the sparrow Janet’s visitor brought for lunch. When the bird had had enough, it flew off with the body in its talons, leaving behind only the beak and part of the head. I couldn’t tell if the brain had been eaten or not, although I rather guess it had, since brains are apparently chock full of nutrients. Perhaps the kestrel ate a quick blast of brain food before carrying off the rest of the sparrow to feed a nesting mate. 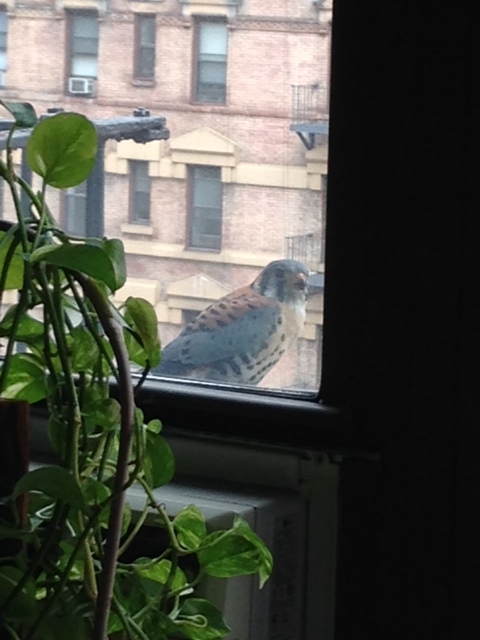 Had Janet not witnessed the kestrel eating the sparrow, she would be left puzzling over the mysterious appearance of a bird head on her air conditioner. What a city we live in, my friends. What a city. All photos in this post courtesy of Janet Rassweiler. But Hamlet, dear, this is easy. 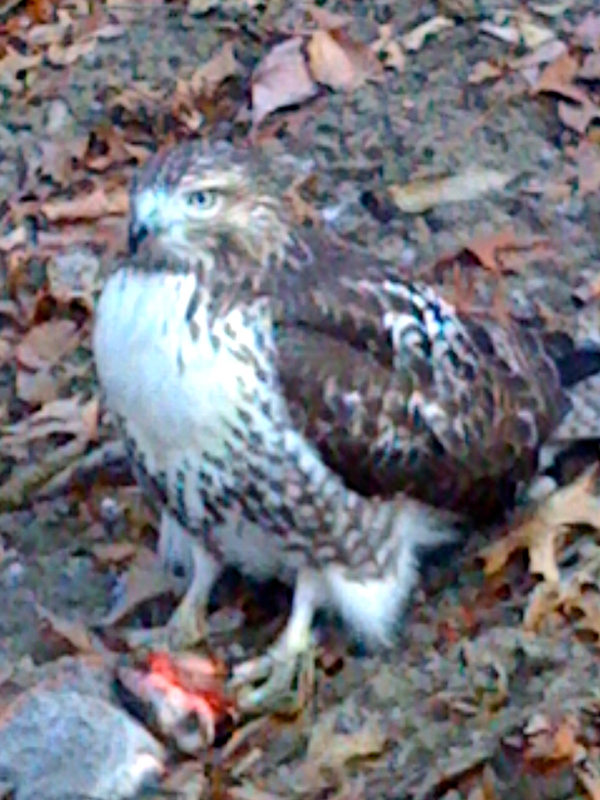 Hawk with squirrel, Riverside Park, NYC. More difficult in low light and at a distance is to know a hawk from a handbag, or more specifically, a plastic grocery bag. More rarely the process reverses, and a plastic bag metamorphoses into a hawk, and flies. These metamorphoses from animate to inanimate, from hawk to handbag, and back again, are among the peculiar pleasures of watching urban birds. 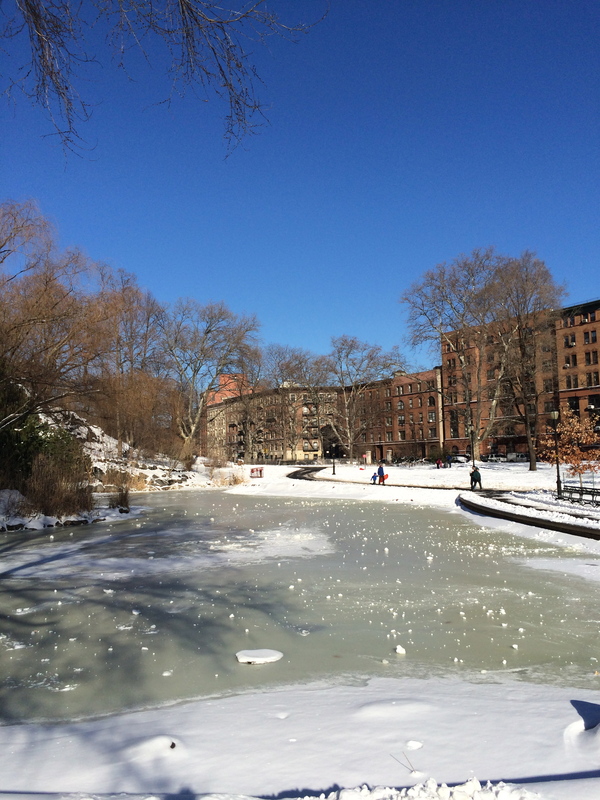 This morning, a stunningly beautiful, spring-like day popped out of a snowy winter. 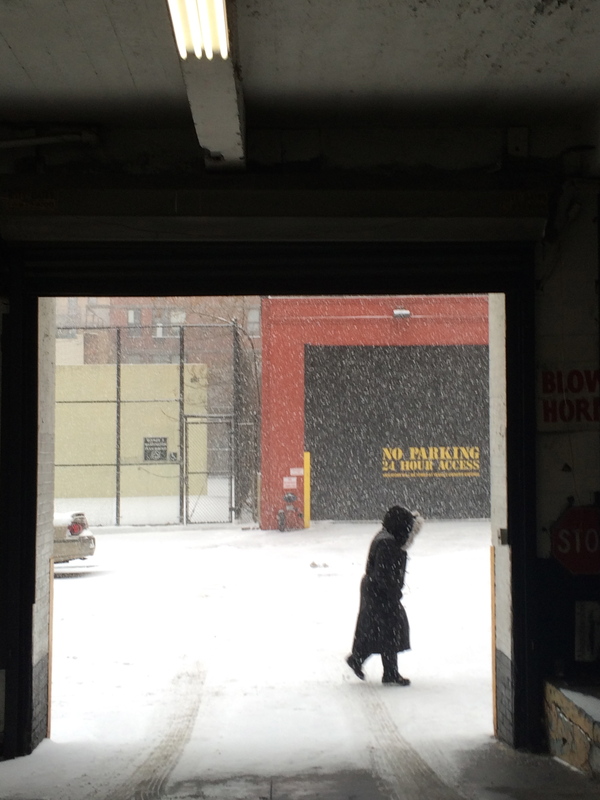 The sky is blue and the snow is, well, black. 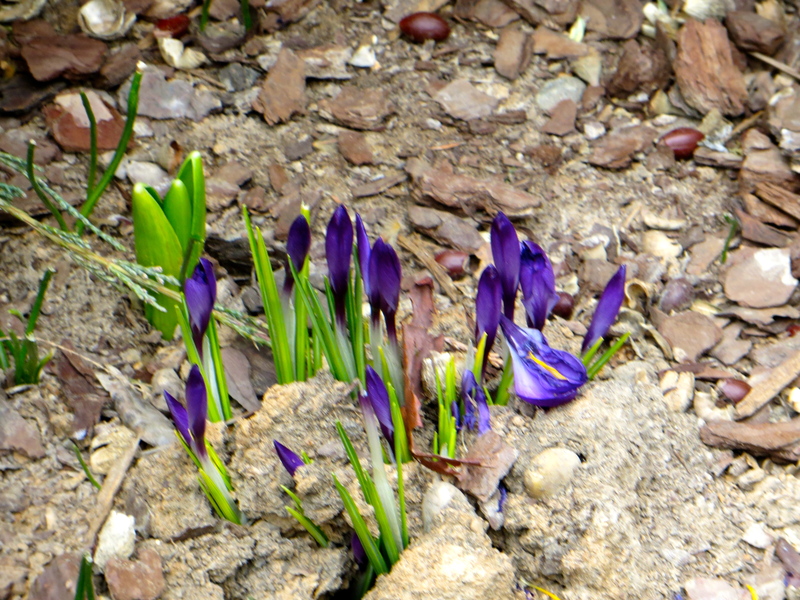 … metamorphose into the dark, satanic mountain range of today? 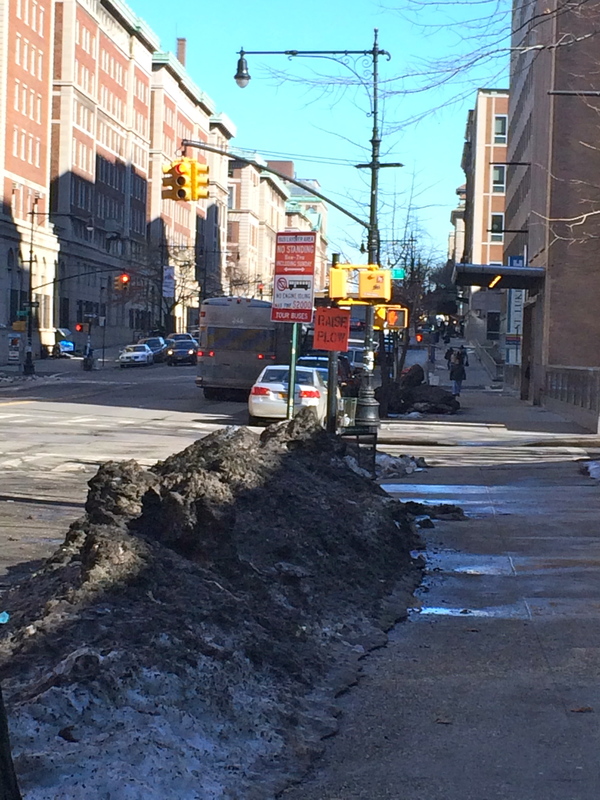 When urban snow reaches this stage, it doesn’t even melt. My theory is that there are now more solid filth particles than there is water in this Substance formerly known as Snow. 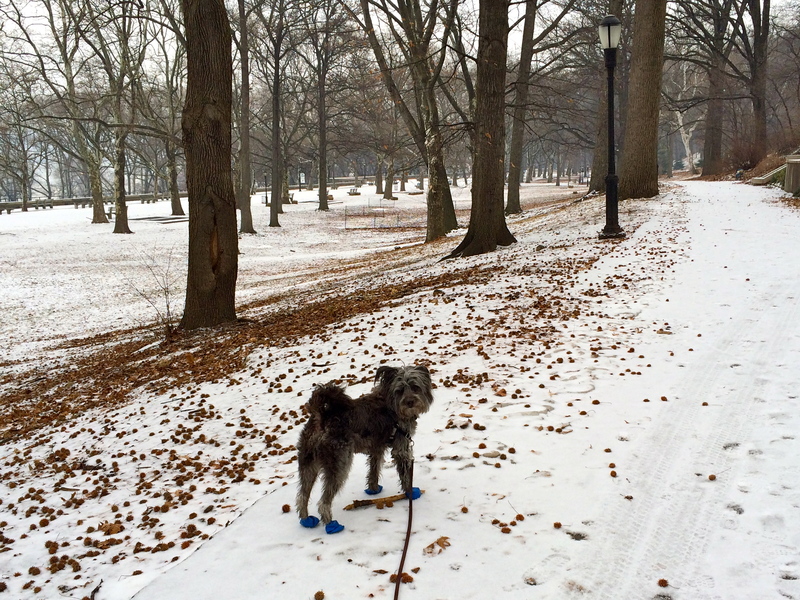 As most New Yorkers know, these mini-Himalayan ranges will diminish only to a point. 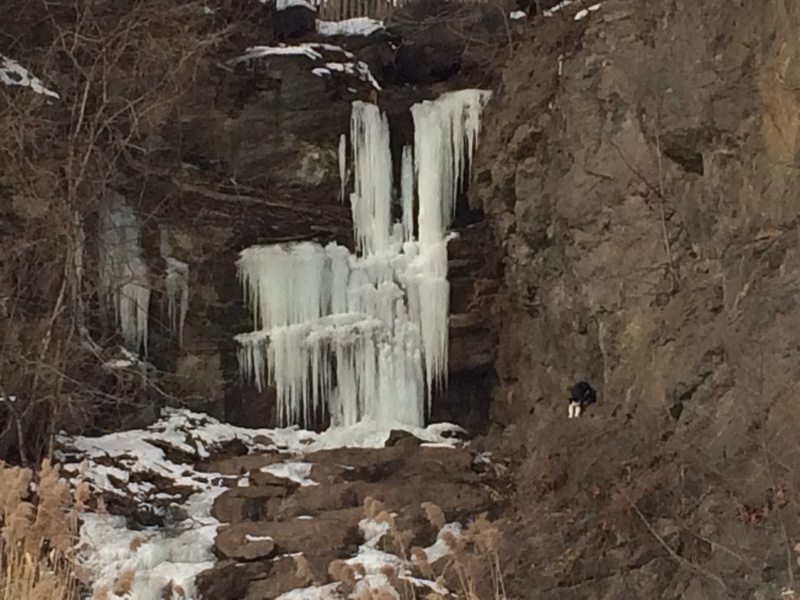 The remaining black metor-like blobs hang around long after the surrounding street snow has melted. 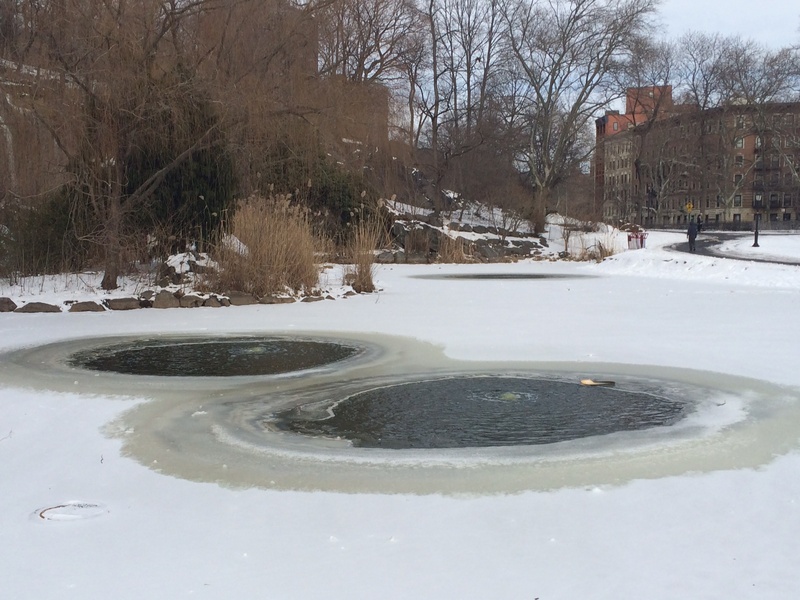 A particularly notable example was a giant blob that threatened to become a permanent resident of 108th Street in 2010. Is it a meteorite? 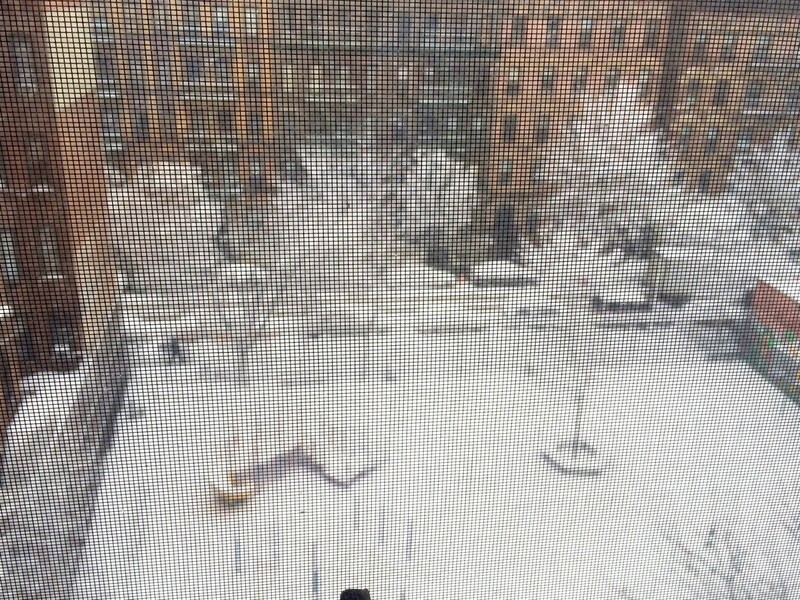 No, friends, that’s New York City snow. Today was a good day for hawk-spotting. 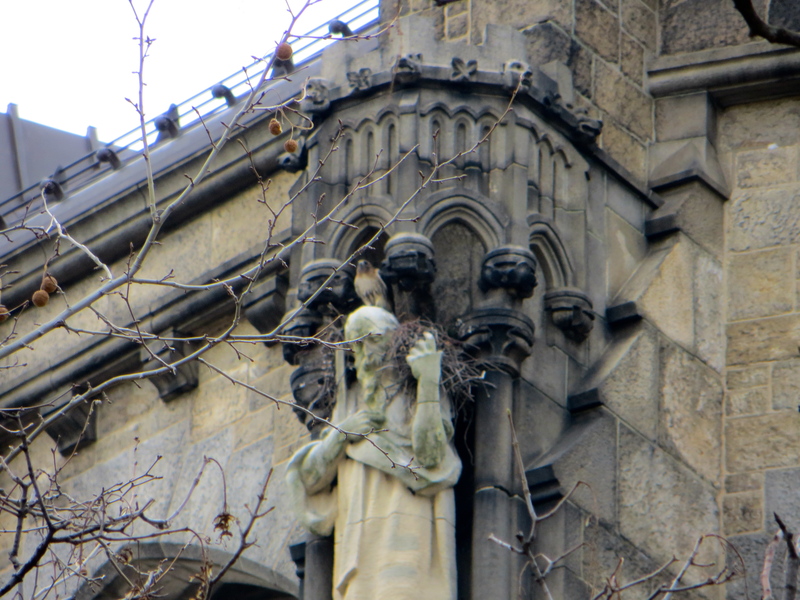 Over on Morningside Drive, one of the Saint John the Divine red-tailed hawks perched above a saint near its picturesque nest before sailing west out of sight. 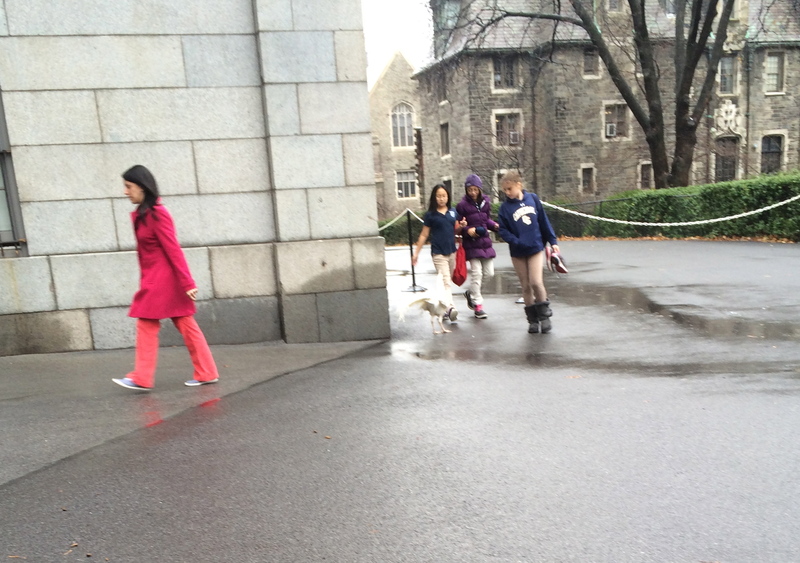 Last winter, daily hawk sightings led me to found New York City’s Hawk-A-Day Club. This year, fellow New York nature blogger, Matthew Wills of Backyard and Beyond, has seen peregrine falcons for five days straight in Brooklyn and lower Manhattan. 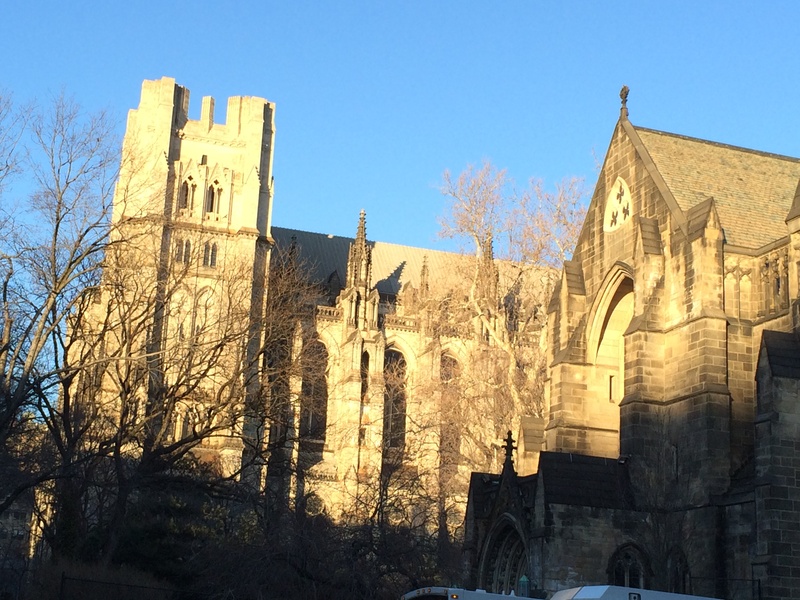 But my Morningside Heights sightings have been surprisingly scarce this winter. 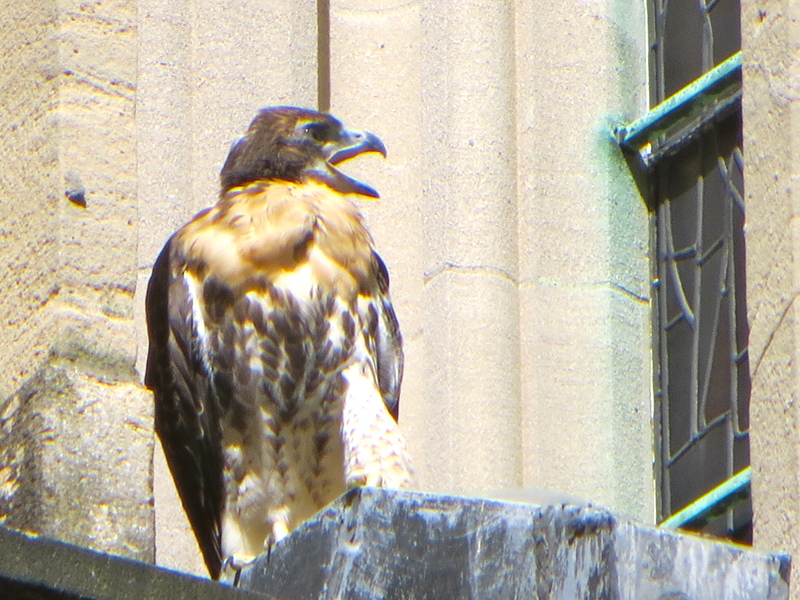 So I was delighted to see a red-tail on the Cathedral. 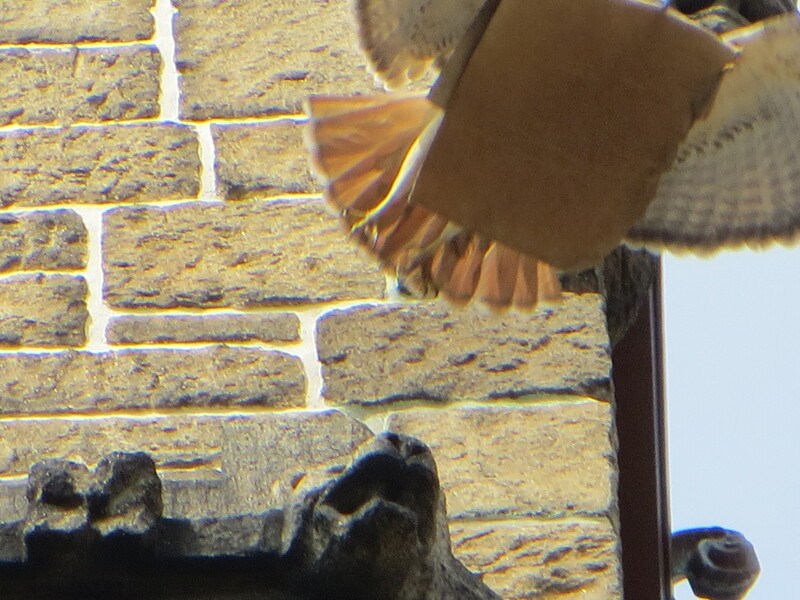 But it was the sight last spring of a hawk wrestling with an unwieldy cardboard box or large paper bag that really led me to question the red-tail pair’s eye for design.Below the hawk flies toward the nest with its catch. For more on hawk cardboard-wrestling, visit last year’s How to Build an Urban Hawk Nest. Next week I’ll once again have a camera that will allow me to take some more detailed shots than has been possible with the iPhone that has been my sole camera for the past six months. 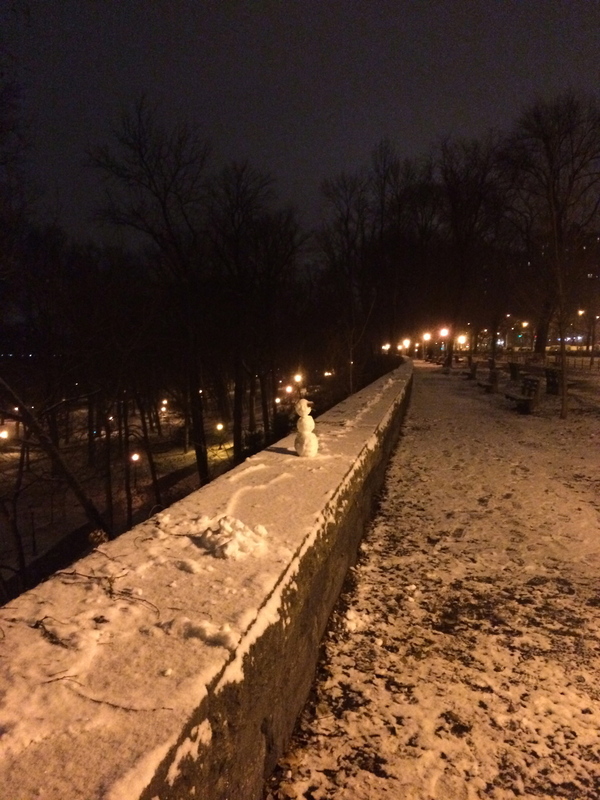 Last night we saw tiny snowmen on the top of the retaining wall in Riverside Park. 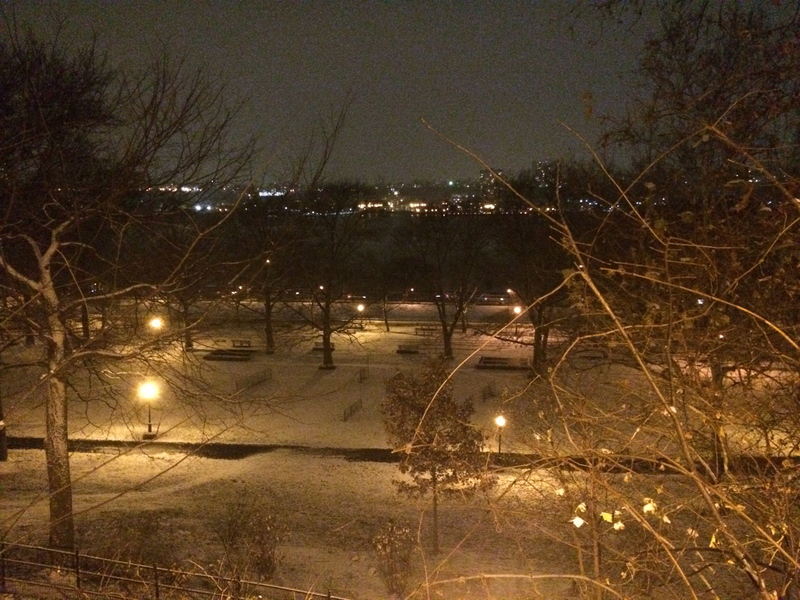 It wasn’t much of a snow, but it gave a mysterious look to the park at night. 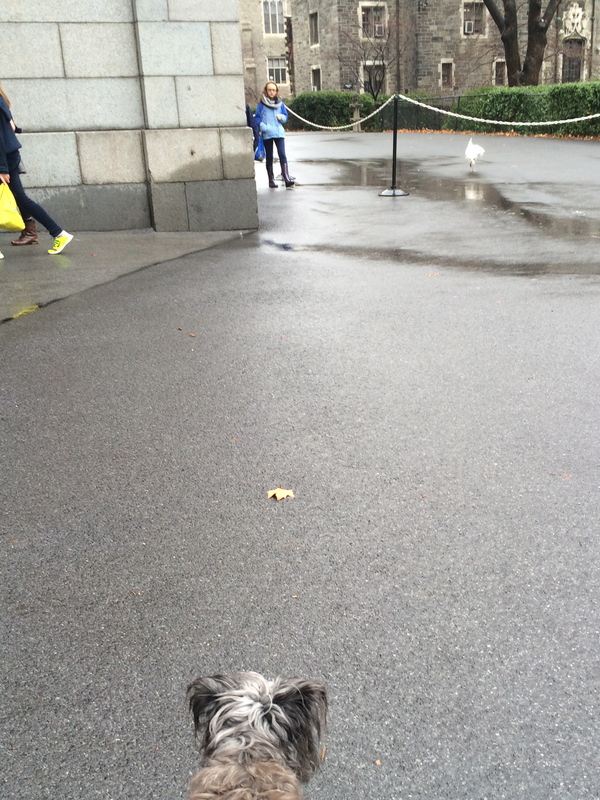 This morning in the drizzle, a Red-tail Hawk flew low over our heads as we were crossing Amsterdam Avenue. 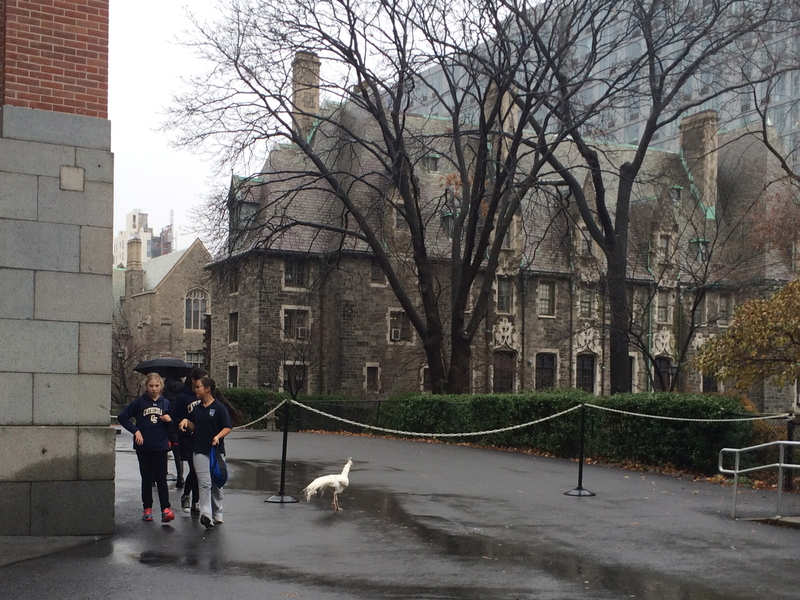 We tracked it as it soared into the animal gates that lead to the grounds of St. John the Divine. 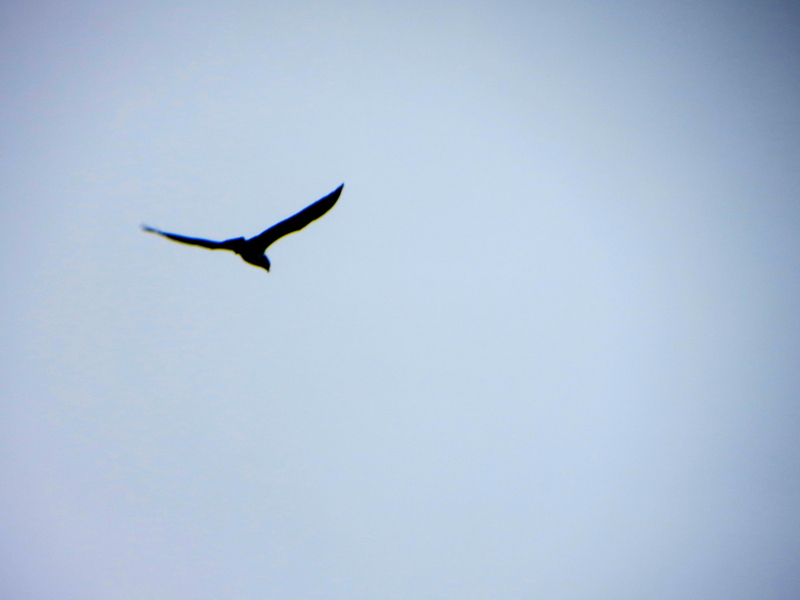 The hawk soared along the path of the grounds, then suddenly swooped upward. 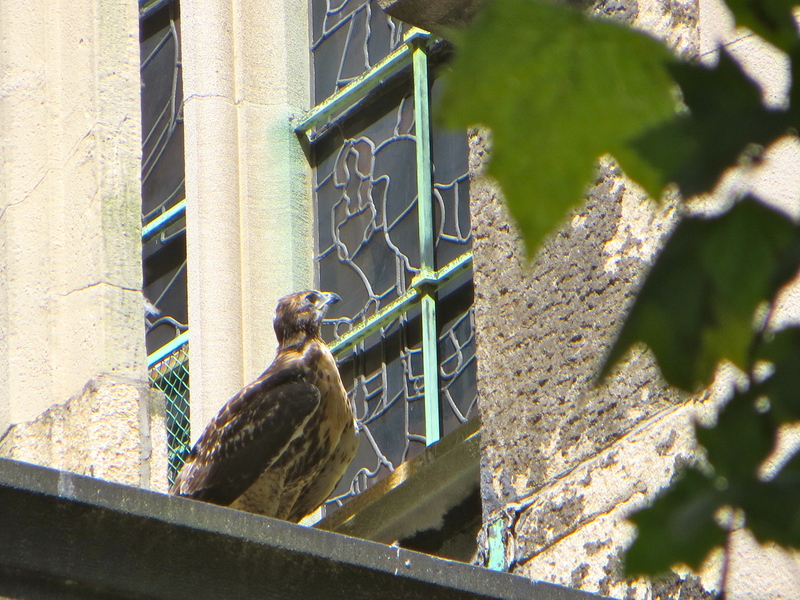 We found it perched with a second hawk towards the back of the cathedral. I have only my iPhone camera these days, so I can’t zoom in for a close look. But here it is with a slightly closer look. 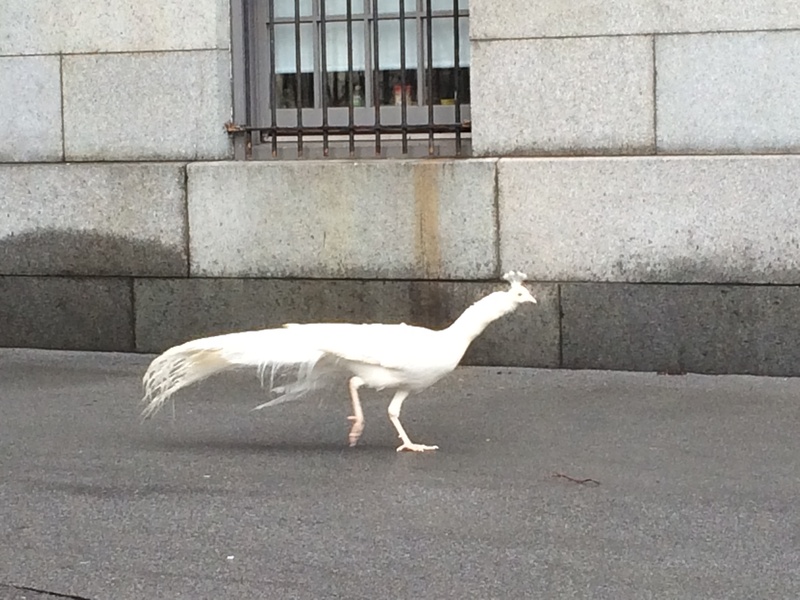 Moments later, as we continued to watch the hawks, Phil, the Cathedral’s white peacock, wandered past us, looking rather bedraggled. He was completely unfazed by a boisterous group of schoolkids who almost walked right into him as they came around the corner. Phil simply moved aside with no fuss or hurry. 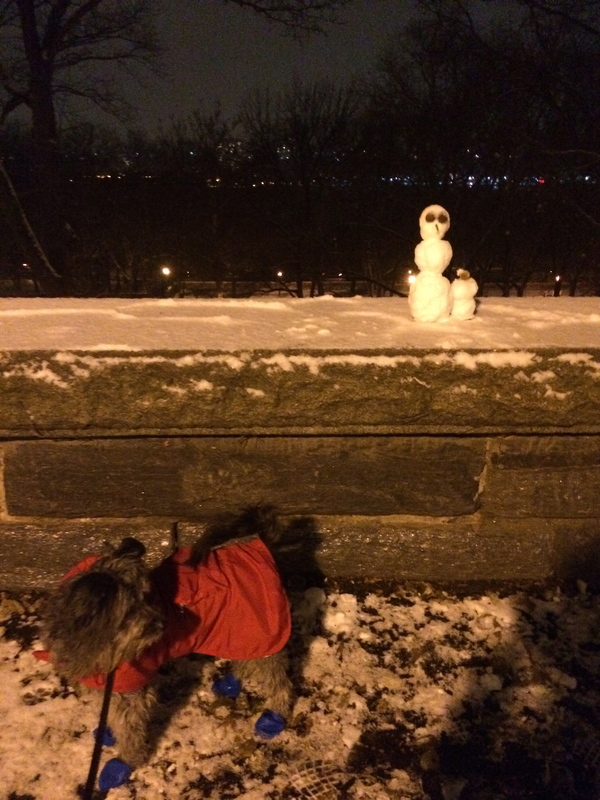 The dog, on the other hand, was definitely fazed by the sight of Phil. 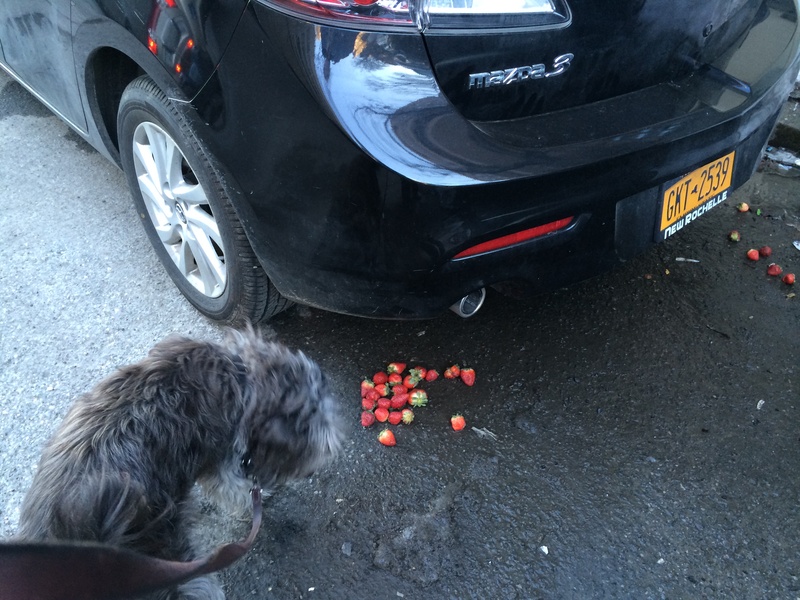 He moaned with frustration and strained at the leash. The poor fellow has been trying for a taste of peacock ever since he first encountered the three neighborhood peacocks five years ago. Ah, well. We all have our dreams. For several days, high winds buffeted Flying Point Road in Watermill. The winds did not daunt the local ospreys. Here are two ospreys hunting, soaring, and hovering over Mecox Bay. Note the power of the birds’ wings as they continually adjust to the winds while looking down into the water for prey. Oh my readers, I have so much to tell you, so much to show you. 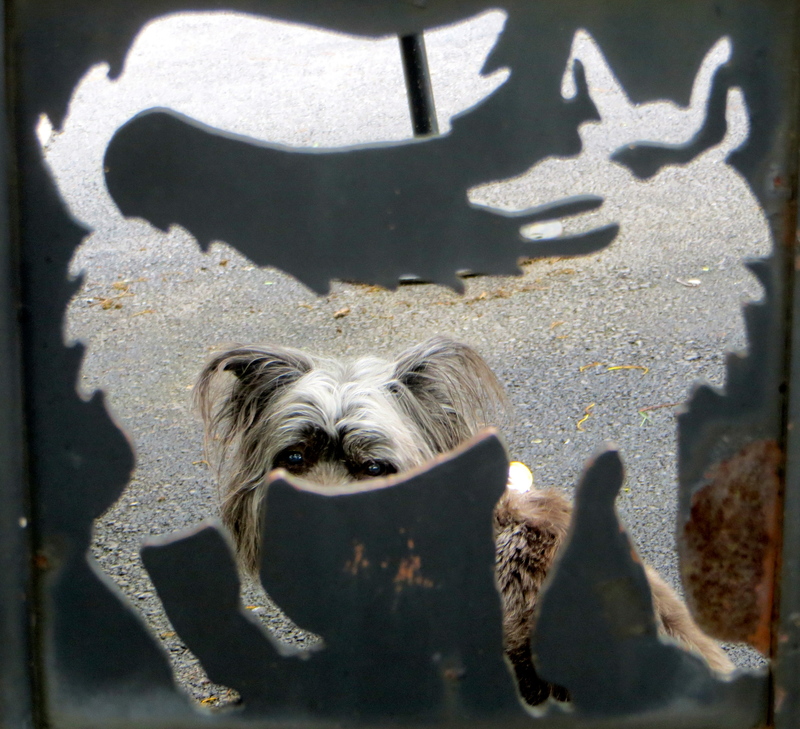 All through the spring, Esau the dog and I have been walking, looking and listening. I’ll try to catch you up on some of the curious, intriguing, and amusing things we’ve seen. But where to begin? 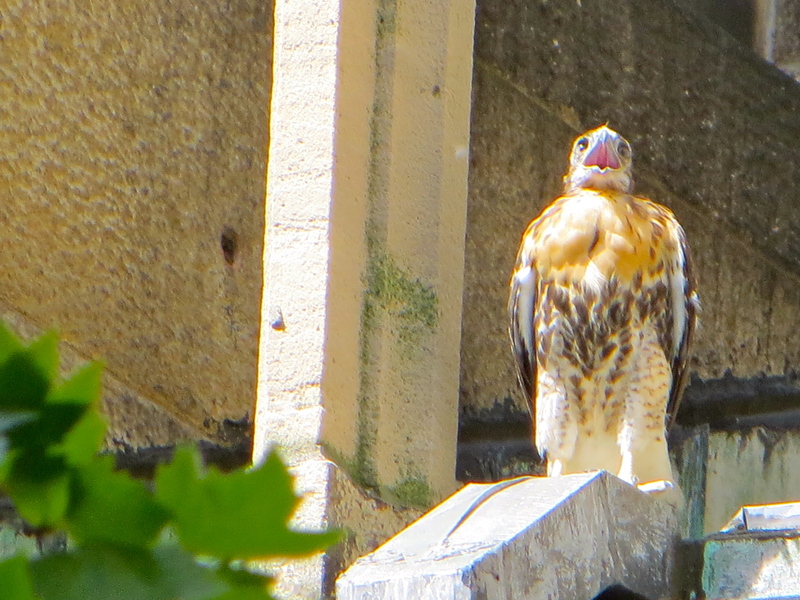 Let’s start with the hawks that nest on the back of the Cathedral of St John the Divine. 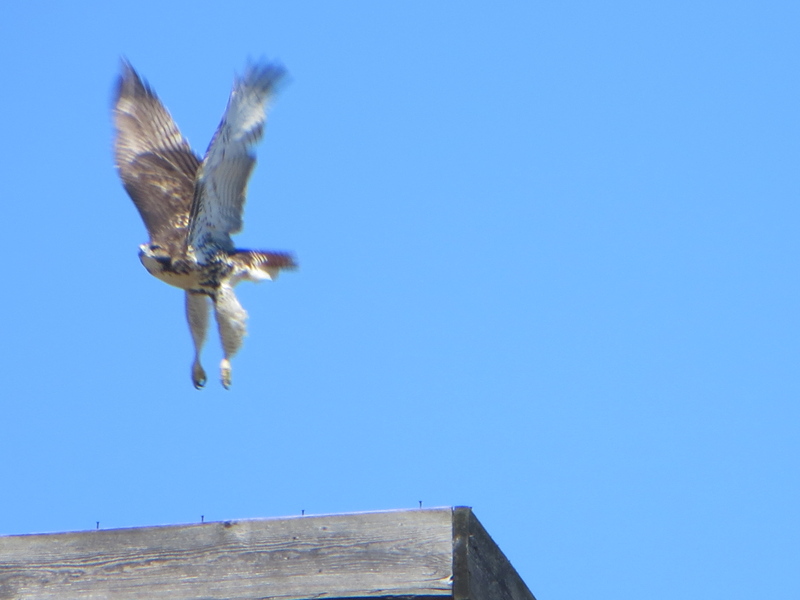 Here is a fledgling hawk on the move this morning. 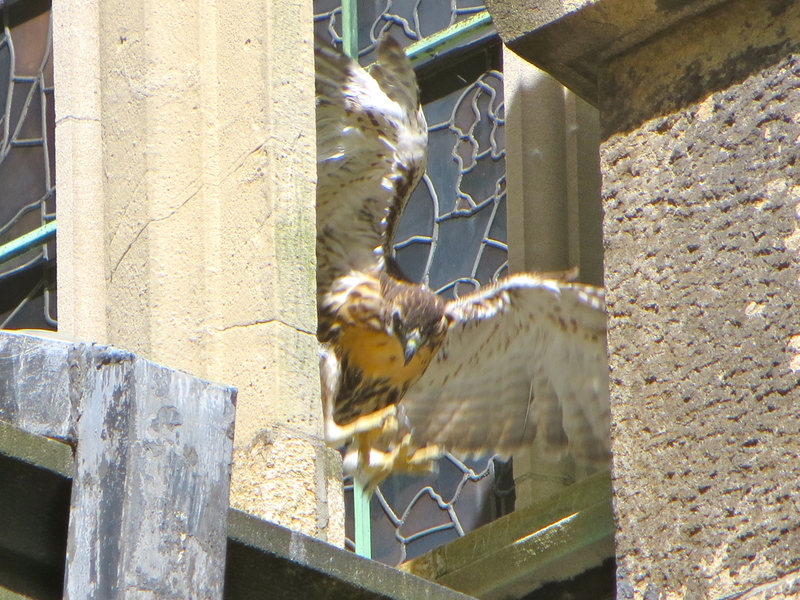 A fledgling hawk on the move in NYC. But let’s back the story up a little. In April, three eyasses (baby hawks) hatched. About two weeks ago, one youngster could be seen practicing its flapping skills on the fingers of good Saint Andrew. 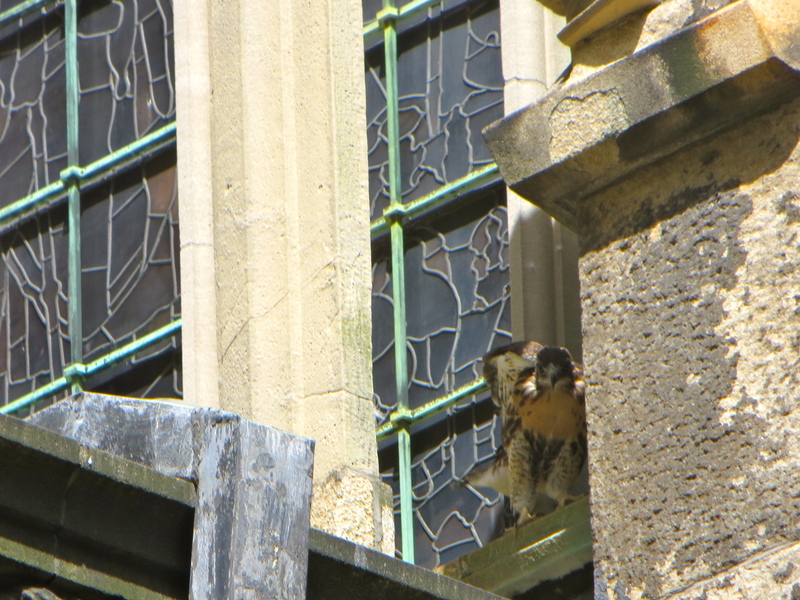 A second fledgling had left the nest too soon, landing on a ledge far below the nest. There it stayed for a few days, not ready to fly, calling to its parents. Calling for food and attention. It called and called in its high voice, but appeared active and healthy. It’s not unusual for baby birds to fall out of a nest before they can fly. Most of the time, the parents will continue to feed and care for their young, as they did with this fellow. 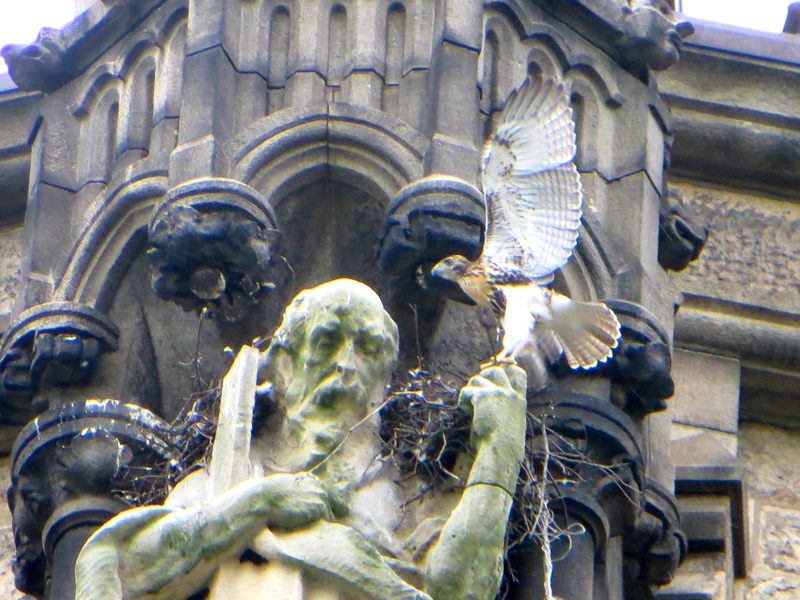 (Morningside Hawks has documented visits by the parents, including the delivery of a dead pigeon to the hungry baby.) 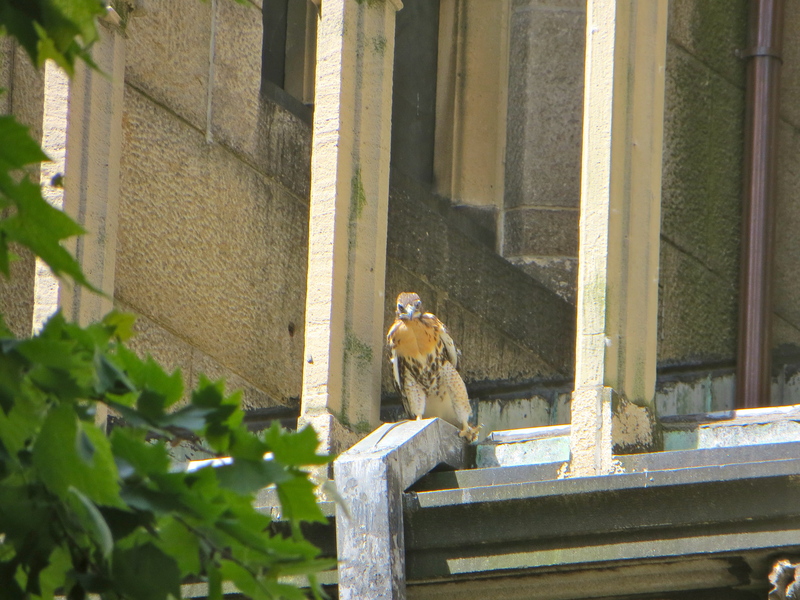 On the day of these photos, the hawk stayed for a while in one spot, on the ledge. Then it started to move around. 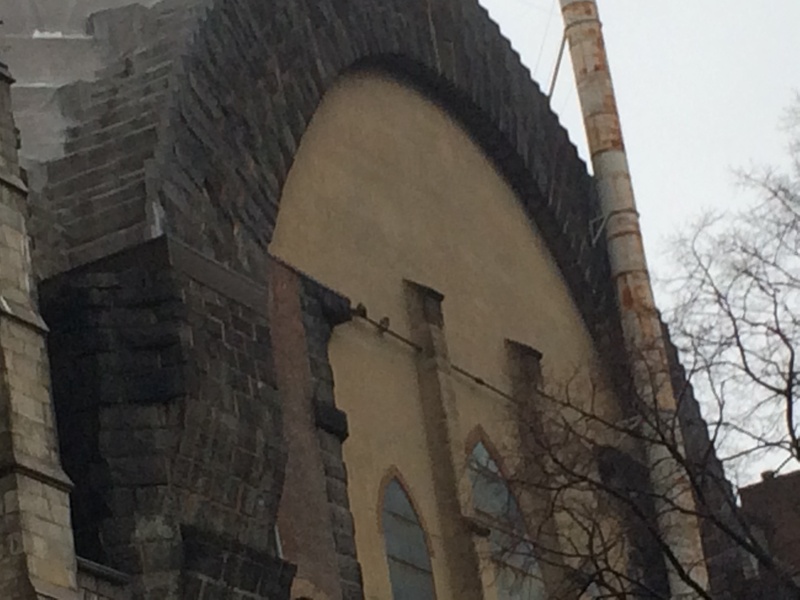 It studied the stained glass window. 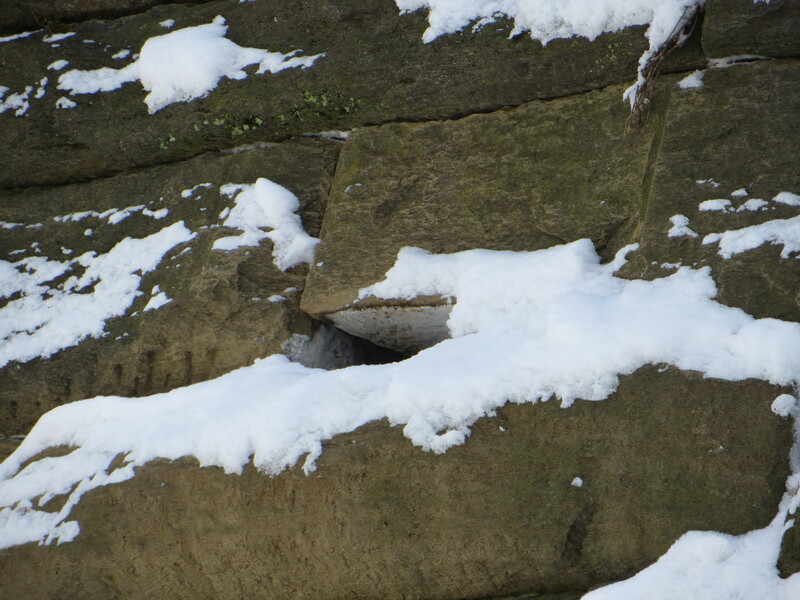 It worked its way along the narrow window ledge to a difficult spot. There it seemed to lose its footing, which led to some serious flapping. 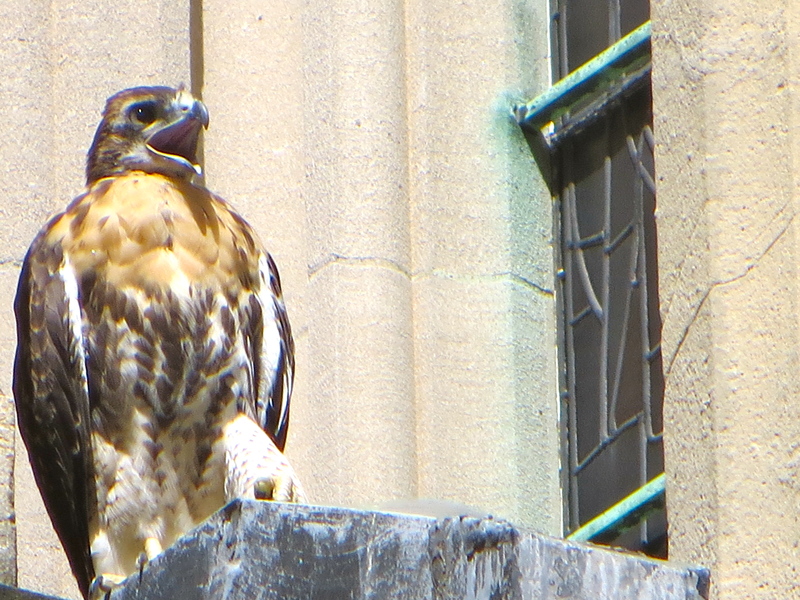 And then, after returning to a better perch, more yelling. 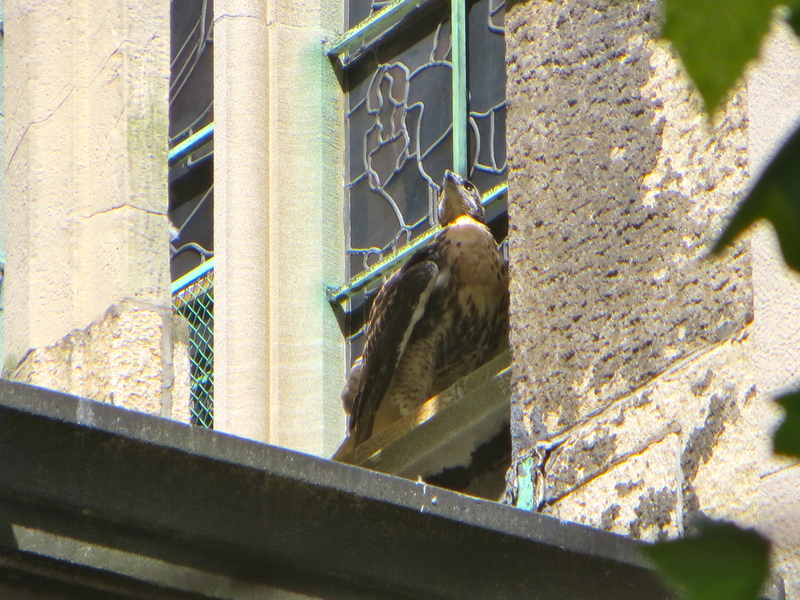 Here is a short video of the young hawk, listening to a siren from St Luke’s Hospital, looking around, preening, and calling. More on the young hawks soon. 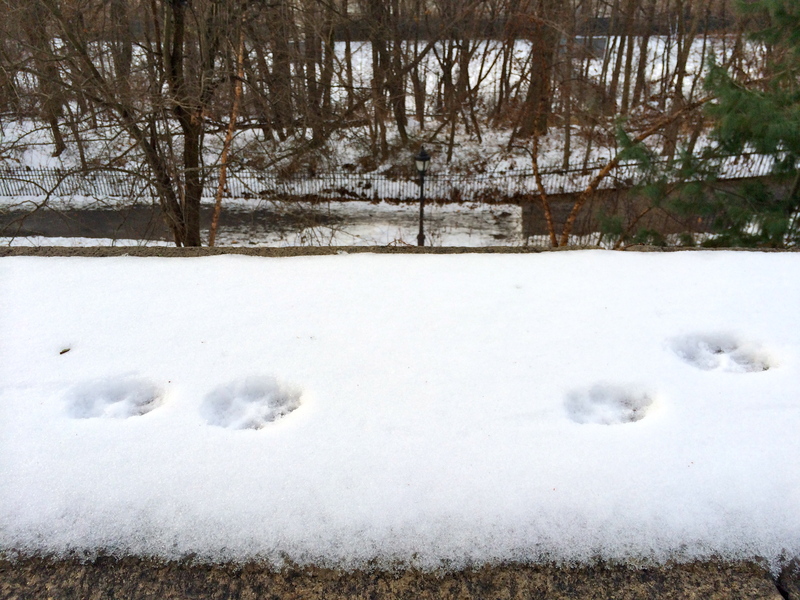 New York City’s wildlife sometimes hit the real estate jackpot. 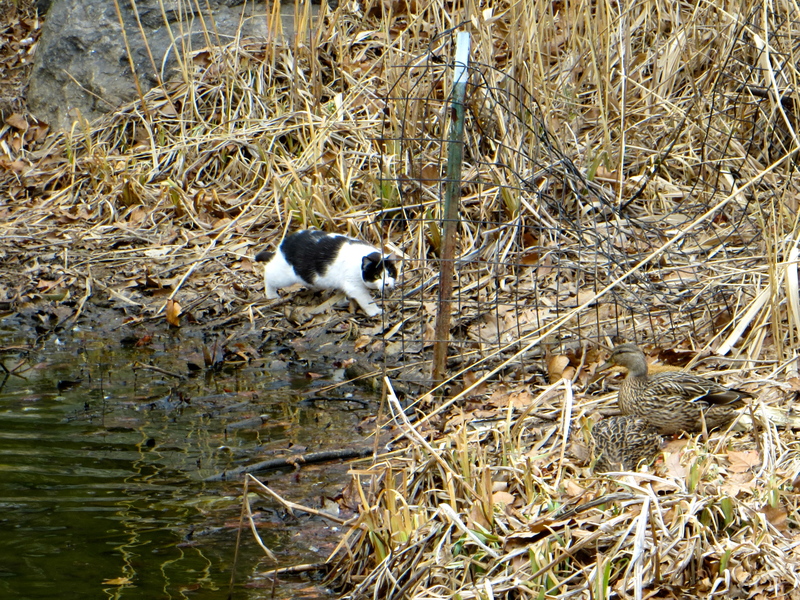 Yes, while many humans can no longer afford to live in Manhattan, the birds and raccoons are doing just fine. 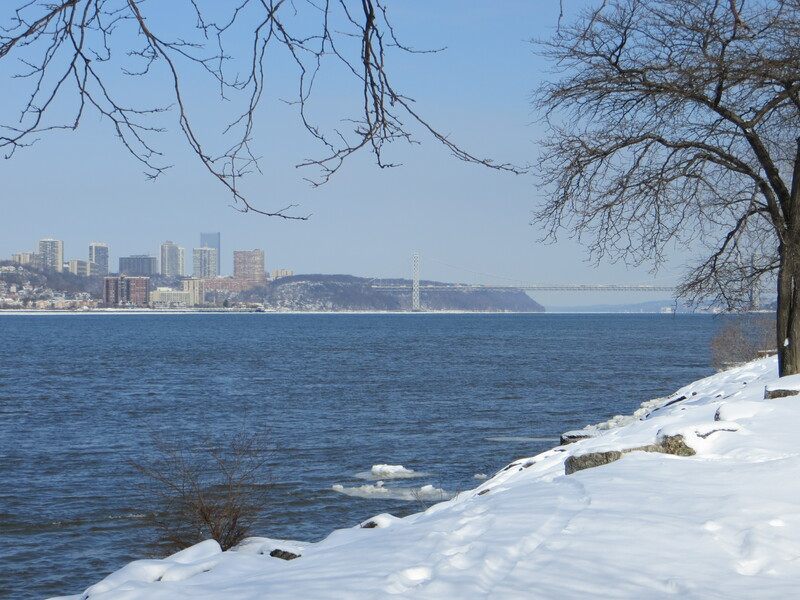 Many even enjoy sunset views like this one over the Hudson River. Some animals prefer traditional pre-war living environments in which to raise their families. Others find that modern materials can be used to create a cozy, neighborly feel. And for the lucky elite, luxury urban dwellings abound. 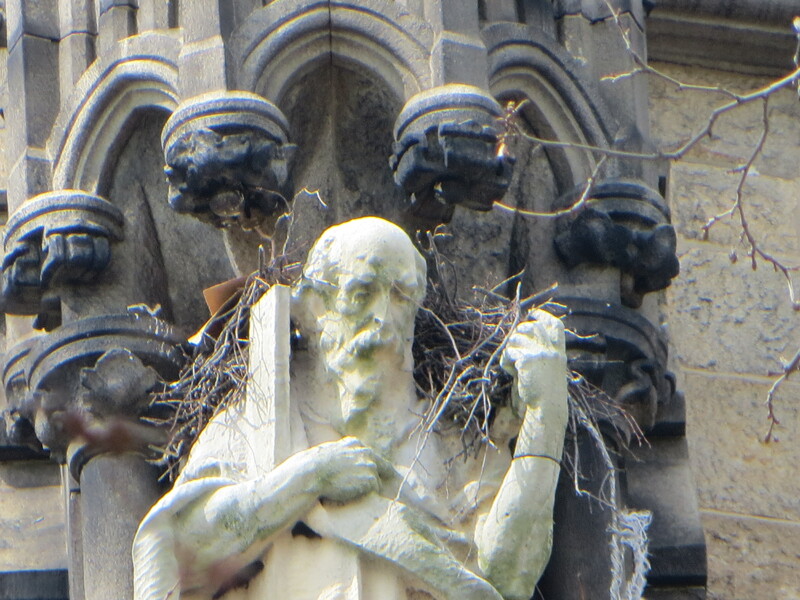 The beautifully detailed statues adorning the entry way to the Synod House at St John the Divine provide temporary housing for generations of house sparrows. 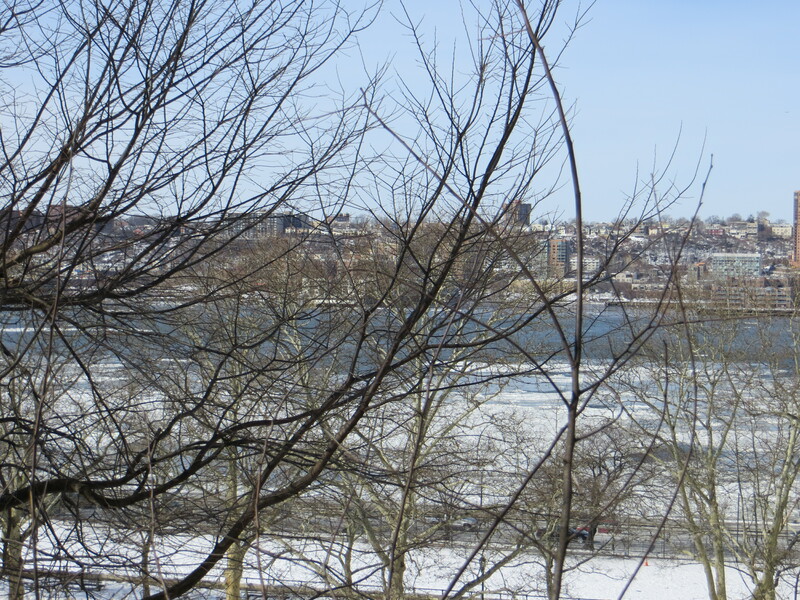 And for private living with sweeping city views, the red-tailed hawks of St. John’s have it made. 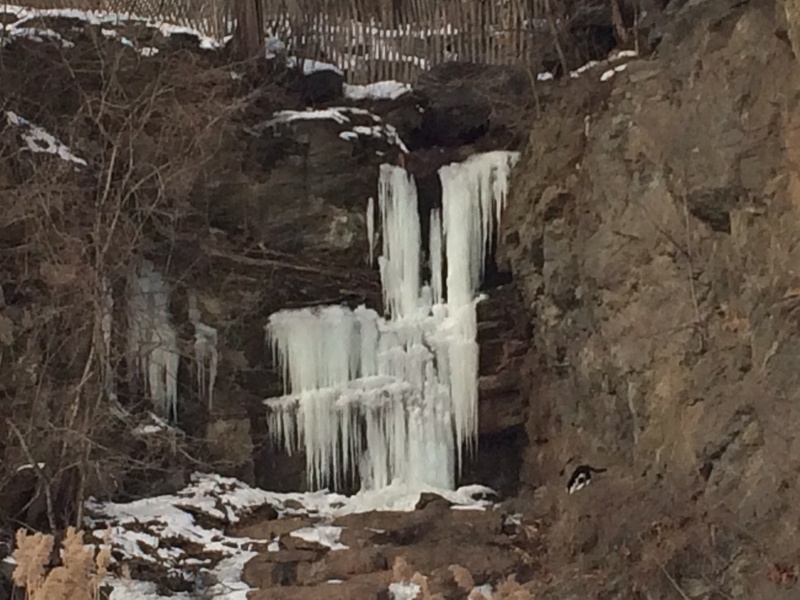 Red-tailed hawks seem to be everywhere I walk these January days. 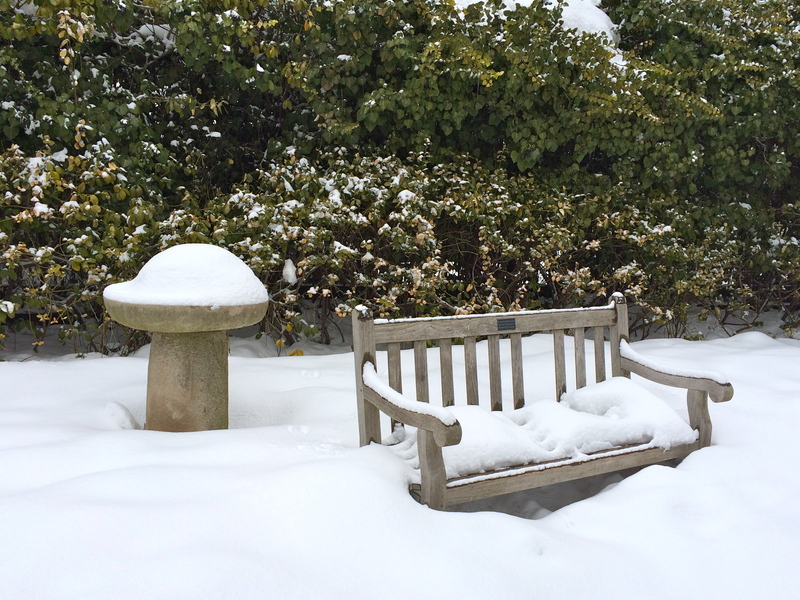 We tend to think of winter as a quiet, even a quiescent, time for the natural world. And so it is for many plants and animals. 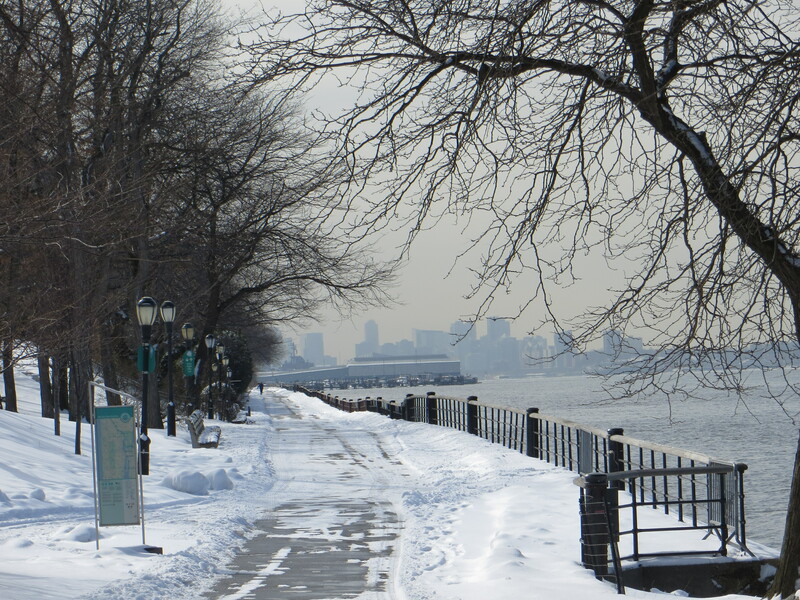 But for others, including NYC’s Red-tailed hawks, mid-winter actually signals the start of breeding season. In the coming weeks, our local hawks will go a-courting. 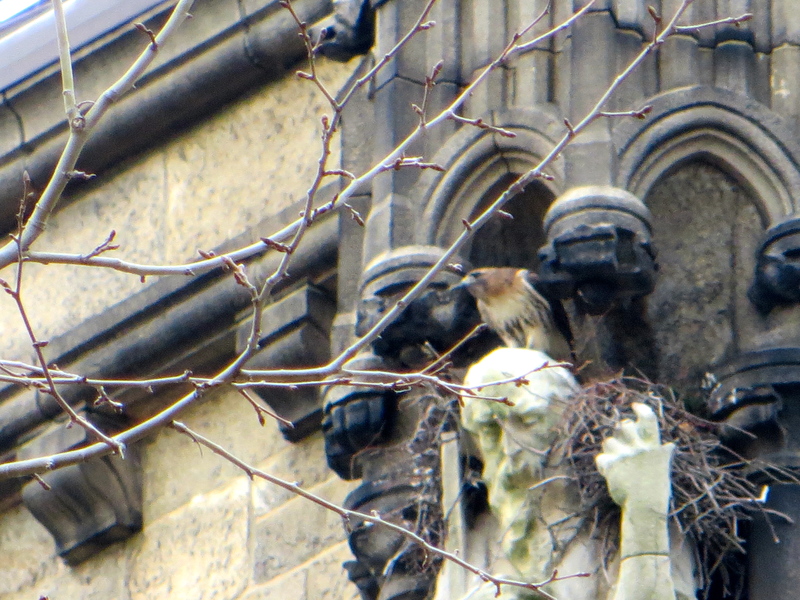 After all, for us to watch eggs hatch in early spring on NYU’s Bobst Library or a Fifth Avenue apartment ledge, the hawks have to lay those eggs a full month earlier, sometimes as early as late February or early March. Before laying eggs, new pairs need time to build a nest, while established pairs must renovate the old nest. And before they start working on the nest, the hawks have to pair up, bond, and mate. Red-tails mate for life, but even experienced and bonded pairs engage in elaborate courtship behavior each year as they enter the breeding season. Red-tail courtship often involves dazzling paired flights, when the two birds swoop and circle together, and sometimes grasp each other’s talons as they spiral down through the air, separating in time to spread their wings and soar again. In late winter and, indeed, throughout the breeding season, unpaired hawks, whether juveniles or adults that have lost a mate, will be on the look-out for potential partners. In NYC over the past few years, several hawks have died from rat poison at various points in the breeding season, and we’ve seen the remarkable swiftness with which a new hawk appears and mating begins again. So look up as you walk in the city this winter. 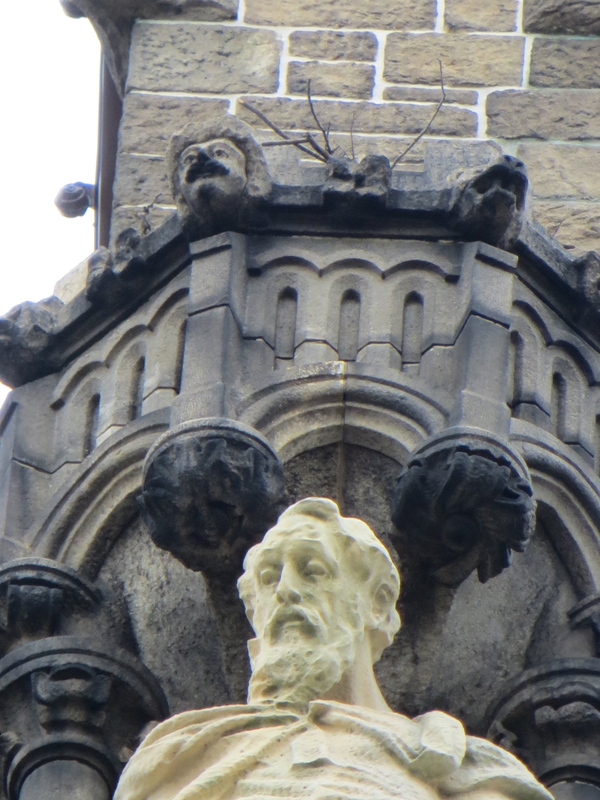 Scan trees, building ledges, statues, and water towers for unusual lumps and bumps that may turn out, on closer inspection, to be a hawk perching and watching for prey. And if you are lucky enough to spot two broad-winged birds soaring high in the sky, circling and swooping, spiraling and climbing, they may well be a pair of red-tails declaring their devotion and preparing to mate. Woodpeckers are such stylish animals. 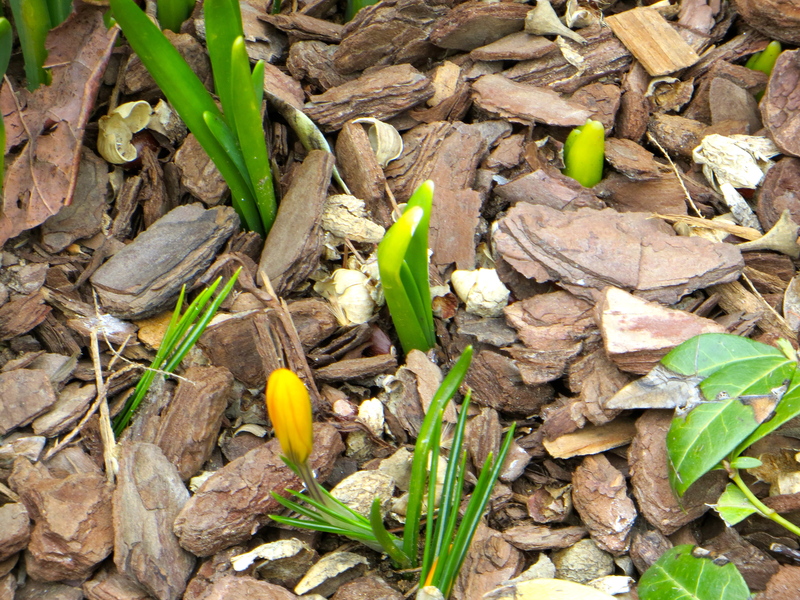 How can I be so sure today when I was unsure two days ago? Because I saw the little devil again yesterday morning. And this time, in case you haven’t noticed, the view was unobstructed and I got photos. The bird was less active yesterday, remaining on its perch for several minutes, looking around from side to side, and up and down. The little bird was probably sitting so still and alert due to the unusual amount of hawk activity overhead. Three Red-tailed hawks were passing overhead, soaring, then swooping low through the trees. Birds and squirrels tend to go into lock-down when the hawks are flying nearby, trying not to call attention to themselves through movement. 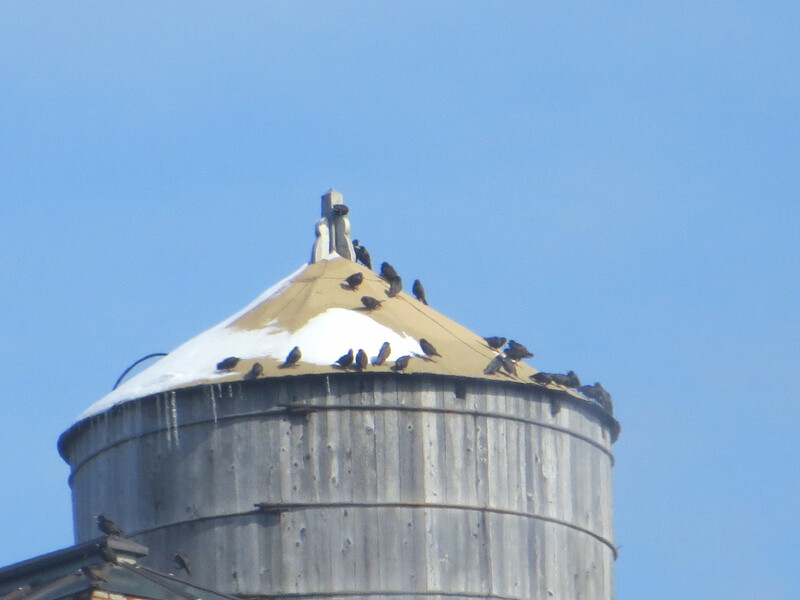 Of course, once the hawks perch, they are no longer much of a threat since their hunting technique involves stooping from the air with great force at their prey. Birds and squirrels can often be quite bold with a perched hawk. I’ve seen squirrels seem to taunt a perched hawk, and the sight of crows or jays mobbing a hawk is fairly common. In rural areas, Red-tailed hawks dine mostly on rodents, but here in the city they are frequently seen eating pigeons and songbirds in addition to rats, squirrels and mice. One of the hawks perched for a while in a neighboring Sweetgum tree, looking much like the piles of leaves, known as dreys, that squirrels build as nests. 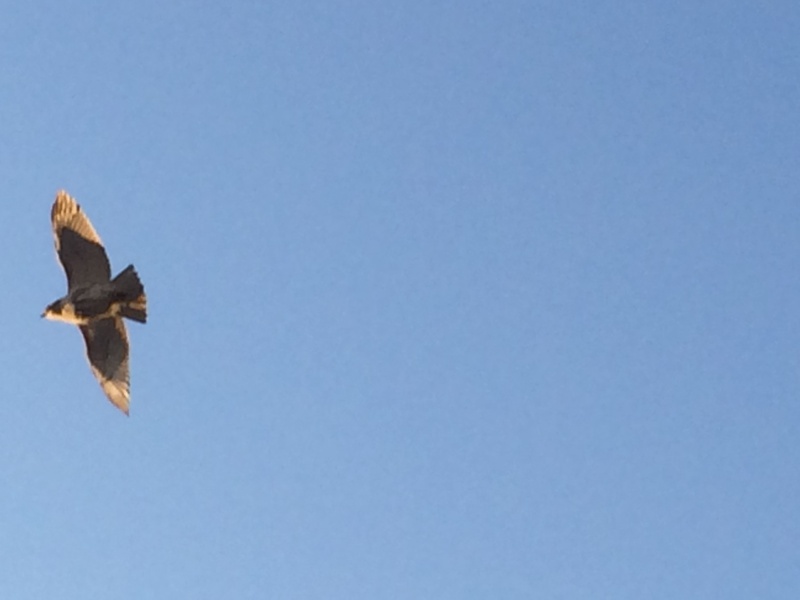 After a few minutes, the hawk unfolded its great wings, and soared off to the southwest. The woodpecker then did the same, swooping across the promenade to a higher branch on another tree. The handsome little bird is a charming addition to the park, easy on the eyes and easy to spot. 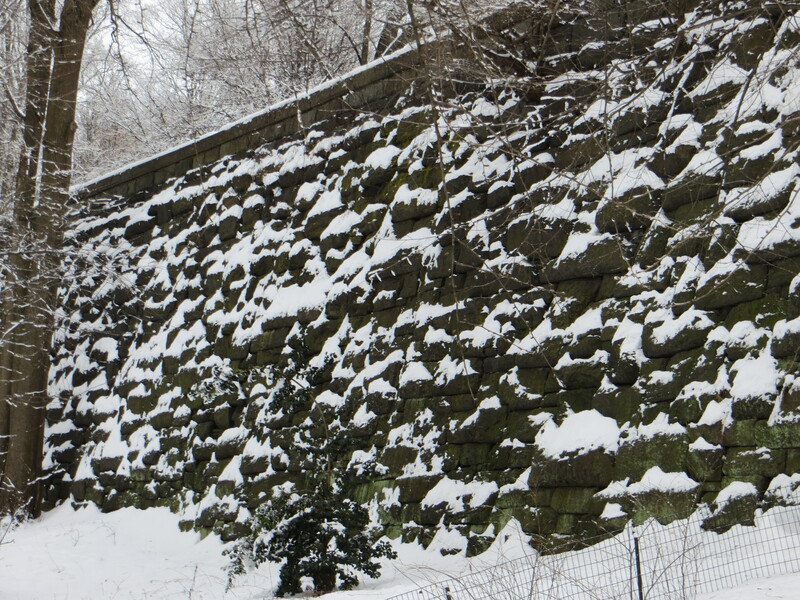 In winters past, I’ve sometimes seen a sole Red-bellied woodpecker in this area of Riverside Park. 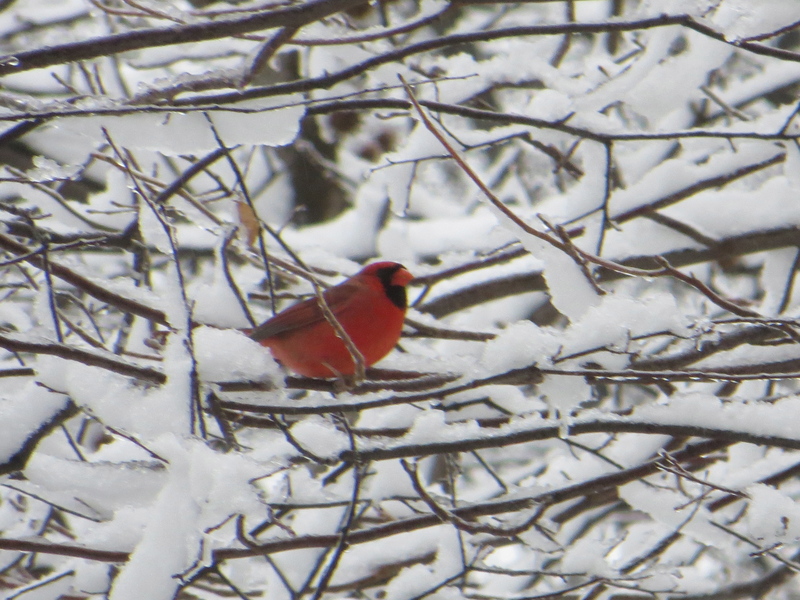 Now I wonder if it is the same bird returning year after year. 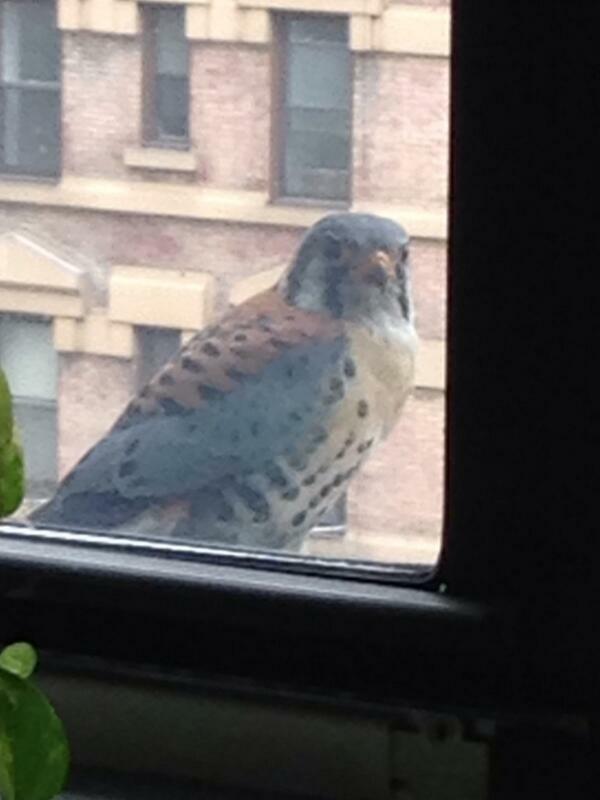 In any event, I hope he sticks around, and continues to evade hawks, cars and other urban hazards.